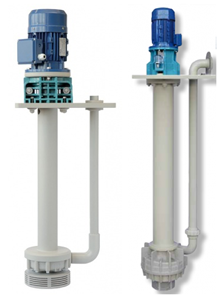 KGK and Equipro range of Argal vertical sump pumps have column and volute casing submerged in the liquid while motor, its support and delivery pipe are assembled to the common base plate which rests on top of the sump well above of the liquid. Argal sump pumps are fitted with vapour seal systems. 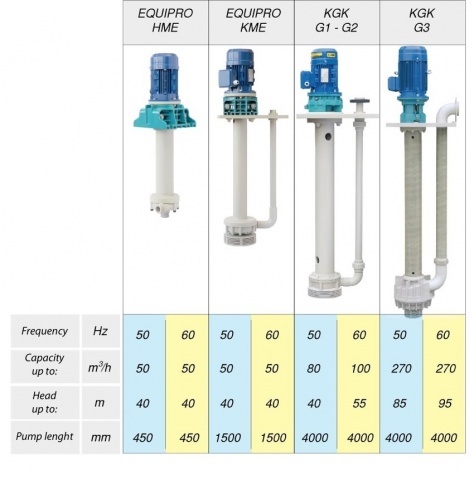 Except for pump series HME and Equipro, whose shaft is overhung and does not require guides, all other pump design (KME & KGK) foresee a sliding guide bushing system ; it is located in the lower side of the pump close to the casing and is available with different choices of materials depending upon main characteristics of the liquid pumped. Different configurations of guiding elements allow to pump liquids laden with solids in suspension or moderately abrasive. All vertical sump pumps host IEC compliant electric motors (or NEMA compliant motors on demand).